Iben Akerlie (b. 1988) has a degree in special education. 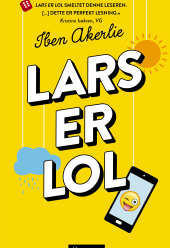 Her debut Lol Lars won ARK Children’s Book Prize 2016, was nominated to The Book Seller Prize 2016, The Norwegian Children & YA Authors’ Association First Book Prize 2016 and The Book Blogger Prize 2016. Iben Akerlie works as an actor and has played in several films and tv-series. She lives in Copenhagen, Denmark.